At CommUSA, we develop and implement wireless solutions for business and government, focusing on two-way radio and wireless broadband technologies. Founded in 1989, CommUSA was awarded a Motorola Charter Dealership in 1991. And we’ve been growing with Motorola ever since. 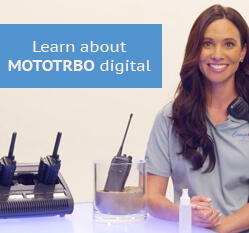 As one of the largest Motorola Channel Partners in the country, our account managers and Motorola-certified technicians have experience in all areas of on-site communications. You can trust CommUSA to provide you with exceptional service and products. Call us and a real, live person answers. No phone trees. And that live person happens to be an expert in radio communications. Your time is valuable and we respect that. Largest inventory of Motorola products. We have what you need and can get it to you quickly. In-house Authorized Motorola Service and Warranty Repair Center. No shipping your two-way radios across the country to another shop for repair. Our expert on-site service technicians know radios inside and out. And they’ll get yours repaired and right back to you. Commitment to quality. CommUSA’s extensive onsite testing area ensures all radios are quality-control inspected before being returned to you. Dedicated account manager. Regardless of scale and scope, you’ll be connected with a technical account manager who will listen to your needs and share their expertise. Motorola Partner Advisory Panel Member. CommUSA was selected to join this exclusive panel of industry leaders to provide input on technologies and share customer feedback. Together, we help steer the direction of the wireless industry. Platinum-Level Elite Specialist, Motorola’s top tier Channel Partner. 17-time recipient of Motorola’s prestigious Pinnacle Award for sales and service excellence. 7 time Motorola Solutions Empower Circle Award, which recognizes Motorola’s best-in-class partners from around the world. 3 time MOTOSTAR award-winner, which recognizes companies for their exemplary efforts to maximize the value of Motorola products and services to their customers.